FTT conducted interviews with interested group managers and discussed the way this should be organized. Further, FTT investigated the options for legality certification of community forests and legal production at timber processing factories. Prior to their mission, FTT asked eight community forests to fill out a questionnaire to get an idea of their current level of organization and their operation. 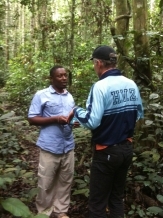 In Cameroon, field visits were conducted near Bertoua and Djoum. Two community forests seem promising candidates for the pilot phase.